Attacks by Russian forces intensified in Ukraine during April, raising tensions in the zone and increasing the possibility of a renewed offensive. ISIS is trying to strengthen its foothold beyond the Middle East, extending through North Africa and Afghanistan. Instability remained in Yemen, prompting geopolitical concerns in the region. East Asia and Europe remained calm. 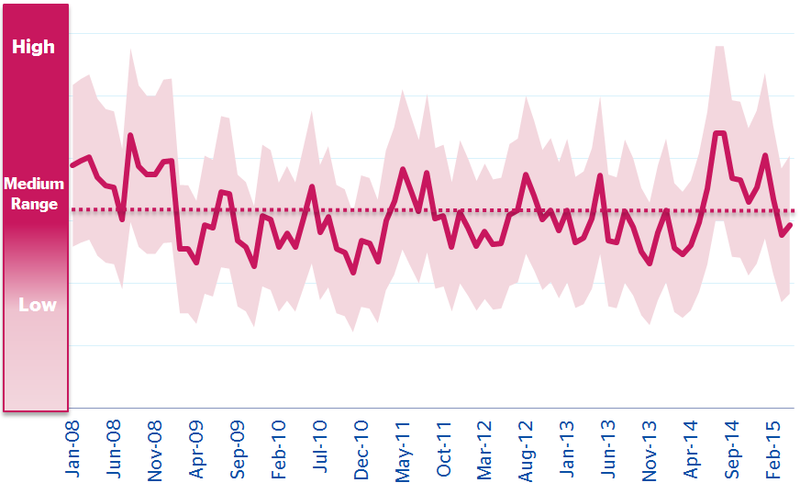 The BBVA Research world conflict intensity index has mildly increased during April on a monthly basis, approaching the historical medium range again after two months of decline. One of the main reasons for the rise was the intensification of the Ukraine-Russia crisis. The probability of a renewed offensive in eastern Ukraine with the potential collapse of the Minsk II agreement has increased over the month. The redeployment of banned heavy weapons to the front line and the intensification of separatist attacks in eastern Ukraine are good indicators of that. Furthermore, the arrival of U.S. military trainers in western Ukraine may be exploited by the Kremlin for further escalation. ISIS continued to hold an entrenched position in Syria and Iraq despite some recent successes by the Iraqi Government and the International Coalition in curbing some ISIS advances. The Islamic group remained in North Africa, but it is also expanding its territory into Afghanistan, which has become an attractive arena for the spread of ISIS after the recent attack in the city of Jalalabad, prompting fears of further attacks and the strengthening of the group in the region. The ongoing fighting in Yemen continued and intensified in some locations. The Houthis still seized and held territory despite the continuation of Saudi-led coalition airstrikes. The security vacuum created by the conflict has enabled Islamic groups to increase their footprint in the country. A political solution of the conflict seems unlikely in the short term, introducing important challenges. 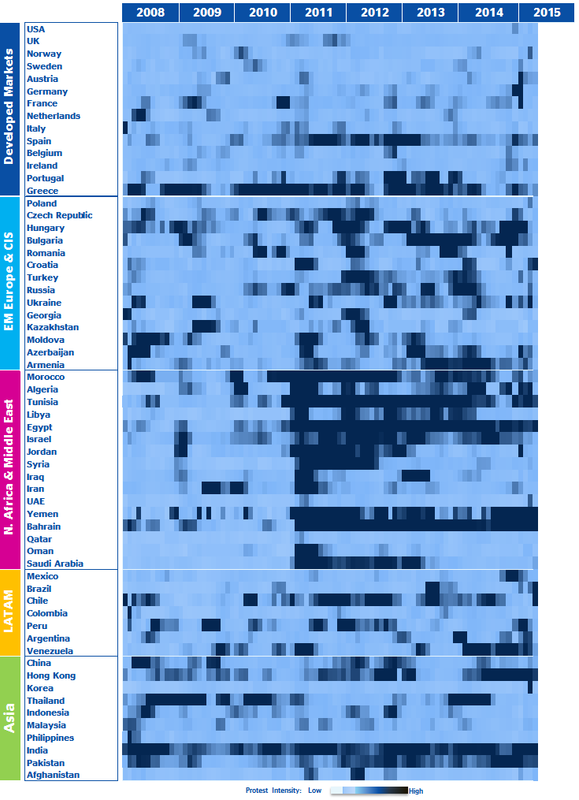 Protests around the world remained at a stable level in April, staying slightly higher than the historical medium level and with significant heterogeneities between countries (as shown by our BBVA Research world protest intensity index). -In regional terms, demonstrations continued to moderate in Western and Emerging Europe and in some Latin American countries. East Asia maintained calm. However, social pressures remained at high levels in the Middle East and North African countries, triggering instability in the area. –In Western Europe, social tensions continued to ease, with only a mild increase in Spain after the demonstrations against the new Citizen Safety Law and in Greece given that social pressures and demands are still alive. –In Emerging Europe and CIS countries, the social instability observed in Ukraine and Russia due to the conflict, economic deterioration and security reasons eased during April. Social discontent in some of its neighbours, such as Bulgaria and Hungary, has also started to relax. In contrast, protest intensity in Croatia has intensified reaching high levels given the several demands to restructure the debts after the sharp appreciation of the Swiss franc. –In North Africa and the Middle East, social unrest continued at worrisome levels. Instability in Egypt and Tunisia remained high, while the instability observed in Algeria at the end of 2014 has started to relax. Some Gulf countries, such as Bahrain and Yemen, maintained extreme levels of unrest. –In Latin America, the situation in Venezuela and Argentina relaxed, while it worsened in Brazil and Chile. –Pressures continued to be stable in Asia, particularly focused on Hong Kong, India and Pakistan. 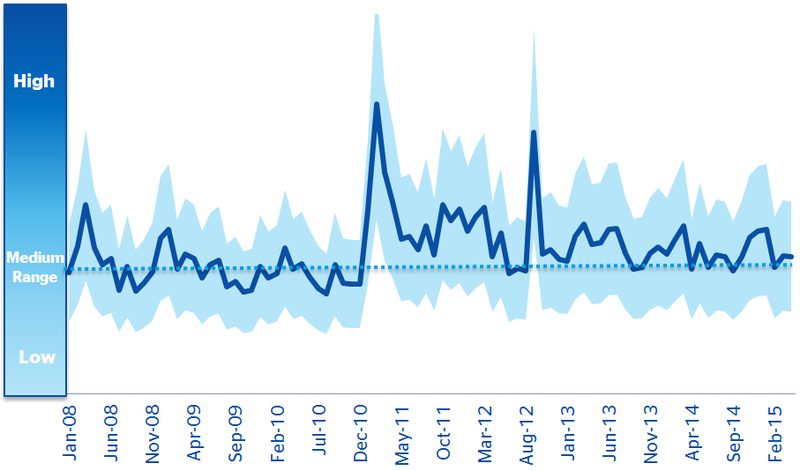 Social alerts observed in South Korea in March have vanished. In sum, social unrest in the Middle East and North Africa continued at critical levels in some countries, escalating after the Yemen crisis, the ISIS advance in North Africa and its recent footprint in Afghanistan. Social pressures eased in most of Latin America with some exceptions, while they remained at stable levels in Western Europe and Asia.